Beat the eggs with the milk, make a well in the centre of the dry ingredients and whisk in the milk to make a thick smooth batter. 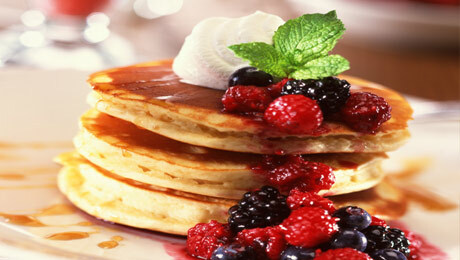 Drop a tablespoon of the batter per pancake into the pan to make pancakes approx 7.5cm/3" across. Make 3 pancakes at a time and cook for about 2 1/2 minutes over a medium heat until small bubbles appear on the surface of each pancake, then turn and cook for another 2-3 minutes. Cover with kitchen paper to keep warm while you use the rest of the batter. Serve with some maple syrup, or berry compote or both! Delicious with a scoop of SuperValu Vanilla ice-cream. This recipe is so easy and the pancakes are fab!!!! Lovely and tasty. So nice and juicy.